While Canberra is enhancing its economic access to Southeast Asia in return for granting Singapore greater access to military training areas in Australia, Singapore’s strategic stock is also rising as Australia’s most advanced and reliable security partner in the region. Australia’s natural strategic partner in Southeast Asia? Singapore’s desire for strategic depth is the major driver behind its interest in the Comprehensive Strategic Partnership. Singapore’s importance as defence partner and forward operating location is also rising, for Australia, in the context of Southeast Asia’s enhanced strategic profile. The most important attributes of this partnership are non-material: a shared mindset, a compatible strategic outlook, and a willingness to commit for the long term. Leading maritime powers such as the United Kingdom and the United States have prized Singapore’s geostrategic location, at the fulcrum of two of Asia’s most important sea lines of communication: the Straits of Malacca and the South China Sea. Singapore’s position astride these two vital waterways, integral to its own survival, has preserved its strategic profile down the decades. The Straits of Malacca, renowned as a strategic choke point for maritime trade through which around 250 vessels and 15 million barrels of oil pass daily, constitute the city state’s western approaches. As the shortest route between the Indian Ocean and South China Sea, the Straits are economically vital in peacetime. But they are less strategic than widely assumed, compared with the Strait of Hormuz, because of the availability of diversionary routes for merchant shipping. Southeast Asia is entering a period of strategic rivalry not experienced since the Cold War. This is playing out in the South China Sea, to Singapore’s east. The South China Sea, long identified as a crucial body of water for Australia’s trade, receives strategic attention in Australia’s latest Defence White Paper as a focus for increasing maritime tensions. Canberra’s renewed emphasis on conventional defence concerns in Southeast Asia reflects an overarching apprehension about China’s strategic intentions, and the stimulus effects of Beijing’s armed forces build-up on military modernisation across the region. This heightened attention to Southeast Asia, China’s maritime assertiveness and its new power projection capabilities forms the strategic backdrop to the Australia–Singapore CSP. The point of departure for Australia’s contemporary strategic relationship with Singapore, long predating its independence, is the British surrender, on 15 February 1942, of its Far Eastern island bastion fortress to a numerically inferior, better organised, more aggressive Japanese attacking force. Australian troops were among those swept along the length of the Malay Peninsula until the last, desperate defence of Singapore itself. The fall of Singapore was a military and moral debacle from which British prestige in the Far East never really recovered. It was also a strategic and emotional inflection point in Australia. A debate still smoulders among UK and Australian historians over who ‘lost’ Singapore. But with Japan’s evisceration of the strategic link to London, Australia’s bandwagon would be henceforth hitched to US primacy in the Pacific. History is relevant here as more than a preamble. The pre-Second World War British imperial economic and security system, of which Australia was part, could be considered as a ‘Mark-I’ version of the ‘rules-based order’, a phrase currently in vogue to describe the post-1945 US-backed security system. Australia’s contemporary strategic environment more closely resembles the pre-war period than it does the Cold War, when Southeast Asia was a ‘theatre’ for proxy strategic rivalry between the superpowers. What makes the comparison compelling is that the US-led global security system is coming under direct challenge, regionally, from a major Asian power for the first time in over 70 years. Australia was the first country to establish diplomatic relations with the Republic of Singapore on 18 August 1965, a sign that Canberra acknowledged the new nation’s strategic importance. In 1971 Singapore entered into the Five Power Defence Arrangements (FPDA) along with Malaysia, the United Kingdom, New Zealand, and Australia. The FPDA is a sub-alliance pact; an agreement to consult among parties in case of an external attack occurring on the Malay Peninsula. It was conceived to provide stability and a measure of continuity for Malaysia and Singapore beyond the UK’s military withdrawal from the region. This continuing commitment by Commonwealth powers, although non-binding, was important in the strategic context of communist insurgencies flaring across Southeast Asia, fractious Singapore–Malaysia ties, and lingering unease about Indonesia’s long-term intentions. Furthermore, by 1971 it was clear that the new Western hegemon, the United States, was winding down its combat commitment in Vietnam, while redefining Asia’s strategic paradigm by making peace with communist China. The US defeat in Vietnam provoked a reassessment of ‘forward defence’ in Australia, prompting a new onus on the ‘defence of Australia’. Although the FPDA is generally considered as a low-profile ‘quiet achiever’, if not an archaic hangover within Australia’s defence engagement, Australian officials have nonetheless maintained a tacit understanding that Canberra’s continuing participation in the FPDA signifies Australia’s role as a ‘quasi-guarantor’ for Singapore and Malaysia. The expectation that Canberra would send forces to help defend peninsular Malaysia and Singapore has always been clearly understood, consistent with the long-held emphasis within Australian defence strategy on ‘holding the Malay barrier’. The geographical limitation of the FPDA to the Peninsula is relevant in the contemporary context, as East Malaysia (composed of the states of Sarawak and Sabah, on Borneo) and Malaysia’s island claims in the Spratly Islands lie beyond its scope. Nonetheless, complex naval and air FPDA exercises have always been staged in the South China Sea, near the Peninsula. Ever since Singapore emerged as an independent state in 1965, it has continuously pursued an active balancing policy as the core of its national security strategy. Unsurprisingly for a state dependent on trade (Singapore remains a free port to this day), it cultivates public and private partners omni-directionally, encouraging as many as possible to develop a stake in the city state’s security and prosperity. Apart from Singapore’s close but discreetly managed security relationship with the United States, it has built a network of defence relations with countries as diverse as Australia, Brunei, France, Germany, India, Israel, New Zealand, South Africa, Sweden, Taiwan, Thailand, Vietnam, and the United Kingdom. Those countries that host Singapore defence assets provide strategic depth, in a physical sense, given Singapore’s space constraints. Others lend diplomatic diversity, if not redundancy, designed to maximise Singapore’s options, thus avoiding the patron-client trap of less proactive small states. Internally, Singapore has adopted a hard-headed approach to defence self-reliance. The city state spends more on defence than any of its neighbours and maintains universal conscription for adult males. The anniversary of Britain’s wartime surrender is still commemorated annually as Total Defence Day — a pointed reminder to Singapore’s population of 5.2 million people (3.2 million of whom are Singaporean citizens) not only of potential external threats, but also of the dangers of leaving the job to others. The military budget, approaching US$10 billion in 2015, is pegged below a ceiling of 6 per cent of GDP. Such is Singapore’s economic success that this has been sufficient to create Southeast Asia’s most professional and well-equipped armed forces by some order of magnitude. Singapore’s Navy and Air Force maintain military ‘over-match’ within Southeast Asia. Its air force capabilities are especially impressive. Since Singapore’s first bilateral defence memorandum of understanding (MoU) with the United States in 1990, its defence and security alignment has grown gradually closer. An upgraded framework agreement was concluded in 2005, leading to an Enhanced Defence Cooperation Agreement in December 2015. Singapore’s strategic value to the United States, as an enabler of its forward presence in the Western Pacific, probably outstrips that of Washington’s treaty-based alliances with the Philippines and Thailand, despite Manila’s recent agreement to grant US military access to five new locations. Up to four US Navy Littoral Combat Ships will operate from Singapore by 2018. P-8A multi-mission aircraft have deployed to the island, as P-3 maritime patrol aircraft did previously. In addition to visits by US surface ships and submarines, US Air Force (USAF) aircraft and personnel stage through Singapore regularly. Military exercises and training programs between the two air forces are particularly close, as reflected in their commonality of platforms. Republic of Singapore Air Force (RSAF) units are based in the United States on a long-term basis to receive advanced training on F-15s, F-16s, and helicopters. USAF combat units deploy frequently to Singapore for exercises. Without any permanent military bases in Southeast Asia since 1992, US naval and air force operations in the South China Sea are made possible by the refuelling, logistical, and other support functions available through Singapore. The US military presence across Southeast Asia has taken on heightened significance for Washington in recent years, as part of its rebalance to Asia, including a heightened focus on the South China Sea. While the US–Singapore military relationship has grown steadily thicker, as a virtual symbol of Singapore’s strategic continuity the refuelling facility at Sembawang used by the US Navy to sustain its forces passing through the South China Sea is the one remaining UK Royal Navy asset still operated on the island, a legacy arrangement also involving the Royal New Zealand Navy. Symbolism aside, access to this significant (duty-free) refuelling facility is available to Royal Australian Navy (RAN) warships calling in at Singapore, under the FPDA. Australian vessels have accounted for between one-quarter and one-half of foreign warship movements there in recent years. Australia and Singapore have gravitated into each other’s strategic orbits for a mix of push and pull reasons. First, close trade and investment ties and a common respect for the rule of law form a natural base to economic relations. As ASEAN’s collective market size has expanded, this has increased Singapore’s importance to Australia as an economic entry point to Southeast Asia. Southeast Asia’s importance has also become relatively more significant to Australia as Northeast Asia’s economic fortunes have waned. Singapore is Australia’s fifth-largest trading partner, and its biggest within ASEAN. In 2014, Singapore was the fifth-largest source of foreign investment stock in Australia, and the second-largest source of new investment flows, behind only the United States. The cumulative stock of Singaporean investment in Australia stands above $80 billion. Both countries are heavily dependent on the free movement of goods and open markets. Second, Singapore and Australia are both ‘odd men out’ in the region, albeit in different ways, and thus feel insecure in their strategic environments. They have encountered similar limits and frustrations in their efforts to build enduring partnerships in Southeast Asia, including regular flare-ups, freezes, and a “shared obsession” with their larger neighbour-in-common, Indonesia. Singapore demonstrates a sometimes prickly protectiveness of ASEAN as a diplomatic amplifier, for itself, and for projecting a Southeast Asian collective voice in spite of its membership’s bewildering diversity. Kevin Rudd found this out the hard way, following the announcement of his Asia Pacific Community initiative in 2008 without consulting ASEAN capitals first, including Singapore. But the persistence of distrust and suspicions within ASEAN also disposes Singapore to pursue more substantive partnerships outside of Southeast Asia. It cuts both ways. Much of Canberra’s foreign policy bandwidth has understandably gravitated towards Indonesia, the Jupiter in ASEAN’s solar system; a gas giant looming biliously on Australia’s horizon. The relationship may not be permanently crisis bound, in the basic sense that the two states no longer view each other as a direct security threat, a major advance from the mutual suspicions of the past. At the same time, the bilateral relationship consistently fails to realise its potential, despite periodic hopes placed in it from Canberra during close passes on what is an apparently elliptical orbit. Nonetheless, Canberra and Jakarta remain in recovery mode from repeated political strains on bilateral relations since 2013. Southeast Asia’s importance to Australia has only become more apparent since then, in the shadow of China’s growing strategic profile. At the same time, Canberra’s search for reliable partners has become steadily more difficult. This is not only because Canberra’s relations with Jakarta have suffered reversals, but is part of a broader trend that has seen many of Southeast Asia’s most important countries undergoing domestic introspection or upheaval. Singapore and Vietnam are perhaps the only two countries in Southeast Asia to maintain an outward-looking strategic perspective. Compared with Indonesia, Singapore stands out as by far the more active security partner in the region. Although not always evident to Australians, the stark fact is that Australia needs Southeast Asia more than Southeast Asia needs Australia. Singapore is the exception to this rule, because of its clearly defined, long-term defence interests in the country. Moreover, Singapore’s advanced technological and military capability is second to none within ASEAN, making it a natural peer partner for defence interoperability and defence industrial collaboration. How many Australians would guess that Singapore frequently has a larger military presence in Australia than the United States? But the most important attributes to this partnership are non-material: a shared mindset and a willingness to commit for the long term. Third, while Australia and Singapore do not have identical threat perceptions, they share a “common strategic outlook”, on concerns from Islamist terrorism and cyber vulnerability to managing great power competition in Asia. Singapore and Australia identify, in similar terms, their respective national interests being at stake on the issue of freedom of navigation, including in the South China Sea. At the ninth conclave of the Singapore–Australia Joint Ministerial Committee in Sydney in March 2016, the joint communiqué called on “all parties to exercise maximum restraint”, refrain from provocative actions, observe non-militarisation of features, and underscored ministers’ “shared interest in freedom of navigation and overflight and unimpeded trade in the South China Sea”. Australia’s 2016 Defence White Paper uses similar language. Australia imports around half of its processed fuels from Singapore’s refineries. In an open market, this does not mean that Australia has a fixed dependence on Singapore and adjacent sea lanes for its fuel supplies (Australia’s more serious energy security concern is its almost total lack of fuel stockpiles). But it is a tangible illustration of the deep interconnection between the two countries’ commercial and strategic maritime interests. Fourth, Singapore and Australia have an existing strong foundation for defence cooperation. For Singapore, the key to the relationship is the access Australia provides to military training areas on a scale not available elsewhere. And as noted by Andrew Robb, Singapore wants to be able to train its troops in a tropical zone. As FPDA members, the two armed forces have exercised together for decades, breeding familiarity and transparency across doctrines and operational concepts, aided by the fact that the Singapore Armed Forces (SAF) and Australian Defence Force (ADF) operate US-produced systems and equipment in common. The strategic potential of a US–Australia–Singapore relationship is suggested by their growing three-way interaction in military exercises. Singaporean fixed-wing and helicopter training detachments to Australia began as early as 1982. Before then Singapore was a recipient of military aid through Australia’s Defence Cooperation Program. Singapore has had access to the Shoalwater Bay Training Area in Queensland since 1990, the same year that the RSAF first participated in the multinational Exercise Pitch Black over Northern and Western Australia. Pitch Black is considered the Royal Australian Air Force’s (RAAF) premier air combat exercise and “makes for a very attractive proposition to … land-scarce Singapore”. Australia already hosts a number of unilateral SAF exercises. The mainstay in the SAF’s annual exercise calendar is the combined-arms set piece, Exercise Wallaby. Wallaby is a large-scale drill, lasting 65 days and involving up to 6000 SAF personnel and around 400 platforms. Night Walker and Wombat are both RSAF unilateral exercises, the latter conducted by Singapore’s C-130 detachment at RAAF Base Richmond for airdrop training. AusSing is a small arms live firing exercise conducted by the Singapore Police Force Gurkha Contingent. In addition there are a number of bilateral Australia–Singapore military exercises aimed at improving interoperability. Exercise Trident is a bilateral, tri-service amphibious-themed exercise that takes place alongside Wallaby, based on a conventional operations scenario. Exercise Singaroo is a bilateral maritime warfare exercise conducted by the Republic of Singapore Navy and the RAN. Smaller-scale bilateral exercises held in Australia include Exercise Star Lion between both countries’ special forces. 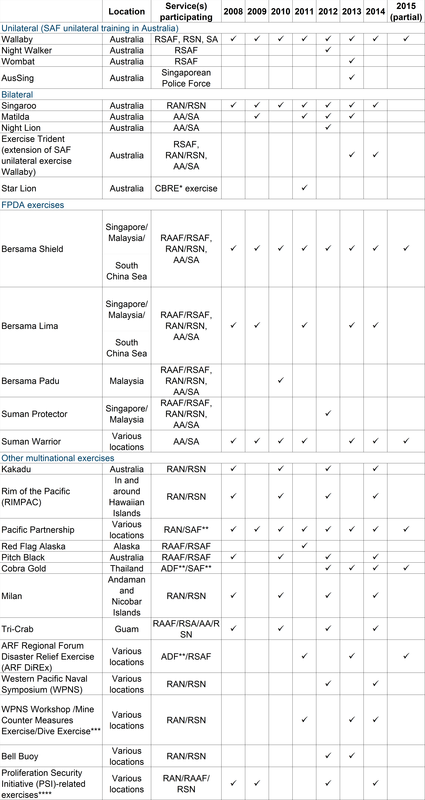 Singapore and Australia further participate in a number of FPDA and other multilateral exercises (see Appendix). Against this background, the CSP is in many respects a natural evolution of strategic convergence. The CSP is couched widely in terms that project a shared “vital interest in the political stability, uninterrupted economic growth and development” of Southeast Asia and the Asia-Pacific region, and “an open and inclusive regional architecture based on international law”. The CSP roadmap, known as ‘Project 2025’, commits Australia and Singapore to a number of policy objectives in the economic, foreign policy, and security realms. Another component relates to people-to-people linkages, not a small consideration given that 50 000 Singaporeans live in Australia, and 20 000 Australians reside in Singapore. Under the CSP, long-term visa restrictions will be relaxed. A closer economic relationship is intended to deliver improved access to and integration of capital markets, increased two-way investment, and collaboration on third markets. This includes a focus on investing in Northern Australia, via the creation of a Singapore–Northern Australia Agribusiness Development Partnership. Under the CSP’s defence component, Singapore has agreed to fully fund military training infrastructure in Queensland worth up to $2.25 billion. This is being presented by Australia’s Coalition government, albeit in the political context of an election campaign, as a significant economic gain in its own right that will generate “a construction boom” and “over $100 million minimum of activity” year on year because of the presence of Singaporean troops. Canberra’s major economic interest lies in expanding the terms of the 2003 Singapore–Australia Free Trade Agreement (SAFTA) to give better access for services and “enhanced aviation and maritime connectivity” (including the introduction of the first scheduled international flight to Canberra). The expanded SAFTA will operate in conjunction with the Trans-Pacific Partnership, according to Malcolm Turnbull, to “further integrate our two economies” including an innovation “landing pad” to be located in Singapore. This captures the essential quid pro quo of the CSP. Singapore’s core interest lies in consolidating its strategic depth, through enhanced access to military training and exercise areas in Australia. In return, Canberra is seeking enhanced trade and investment access to Singapore and Southeast Asia via an enlargement of SAFTA. Surprisingly, perhaps, the military content and motivation to the CSP is clearer on the Singaporean side. In foreign policy, the CSP commits to alternating annual leaders’ meetings and enhanced coordination on the various ASEAN-centred dialogues, including the East Asia Summit. In defence and security, five areas for policy cooperation are identified. First is Singapore’s interest in increased “access to, and enhancement of” joint development of military training facilities in Australia. Second, new military and civilian exchanges including postings. Third, improved cooperation on counterterrorism, cyber security, and other transnational threats. Fourth, improved intelligence cooperation and information sharing. Fifth, enhanced defence scientific cooperation, building on the existing bilateral MoU for Cooperation in Defence Science and Technology. The CSP launch started the clock ticking on a commitment to conclude both the defence cooperation agreement and SAFTA review by July 2016. While some details remain outstanding, this goal appears to have been largely met in the terms of the 6 May 2016 CSP announcement, as virtually the federal government’s last act of policy ahead of a general election campaign. One feature of the CSP with Singapore is that it calls for the two-way placement of uniformed and civilian officials, implying a significant level of trust and institutional cooperation — especially if substantive two-way postings are envisaged. Australia has seconded foreign nationals within its government departments and agencies before. But this is Singapore’s first bilateral arrangement to embed foreign officials, including military service personnel, within its system. Another notable feature of the CSP, separating it from some of Australia’s less substantial ‘strategic’ relationships, is an explicit commitment to intelligence sharing in “areas of common interest”. This is Singapore’s first public commitment, or even mention, of intelligence exchanges with another country. Intelligence sharing is obviously among the highest indicators of trust in a government-to-government relationship. Singapore and Australia have, in fact, engaged in intelligence exchange for many years out of the public eye. Terrorism has provided an enduring focus in the post 9/11 period. Terrorism has enabled Australia’s intelligence and law enforcement agencies to develop a close relationship with their Singaporean counterparts (as it has, on a different level, in Australia’s counterterrorism relationship with Indonesia). As the threat posed by returning foreign fighters from the Middle East evolves, involving nationals from both countries, reciprocal intelligence cooperation as part of the CSP framework is certain to continue in the years ahead. As part of the CSP, Australia will host an inaugural security forum later in 2016. The Project 2025 roadmap also commits both governments to sharing expertise on cybercrime investigation techniques and digital forensic capabilities. Aware of its potential vulnerabilities as a high-profile target, Singapore has invested significantly in its cyber defence capabilities, and is set to double the number of staff at its Cyber Defence Operations Hub by 2020. Singapore’s entrepôt role has also made it Southeast Asia’s financial centre, and therefore a node from which money laundering and other illicit money flows in the region can be traced and potentially stopped. It also plays host to relevant international organisations, including Interpol’s Global Complex for Innovation, which is focused on cybercrime. In addition, there is the Information Sharing Centre established under the Regional Cooperation Agreement on Combating Piracy and Armed Robbery against Ships in Asia (ReCAAP). Australia is one of ReCAAP’s 20 contracting parties committed to collaborating against maritime crime, which is still prevalent in Southeast Asia. In this way, the bilateral partnership with Singapore brings economies of scale for Canberra, through Singapore’s regional ‘hub’ role. The 2016 Defence White Paper identifies Singapore as “Australia’s most advanced defence partner” in the region. The strategic returns from Canberra’s investments in defence engagement are debated. But the Defence White Paper adopts a noticeably pragmatic approach, linking engagement to the improvement of ADF capabilities and partnerships that will enable Australia’s military to deploy “quickly and effectively” in the region, and to “support the capacity of partners to operate in concert with the ADF”. In this sense, Singapore offers a more promising capability return than other countries in Southeast Asia. Under the CSP, that will include the upgraded joint training facilities in Queensland for which Singapore has agreed to pay, as these will be available for the Australian Army when not in SAF use. While the majority of bilateral SAF–ADF interactions are likely to occur in Australia, Canberra policymakers should not lose sight of Singapore as a strategic forward operating location offering direct access to the Straits of Malacca and the South China Sea. Australia also maintains a naval liaison officer at Singapore’s Information Fusion Centre, a multi-nation information-sharing facility for maritime security hosted within Changi naval base since 2009. If Australia decides to undertake freedom of navigation or more regular presence patrols in the South China Sea, Singapore would be a natural choice to support forward operations. Australia continues to maintain an air defence command and ground security presence at Malaysia’s Butterworth, more than a quarter of a century after the last RAAF squadron was withdrawn from the air base. As the most important aspect of Canberra’s FPDA commitment, an RAAF Air Vice Marshal is forward-deployed at Butterworth, in command of the peninsular-wide Integrated Area Defence System. Under Operation Gateway, the RAAF still regularly conducts long-range maritime surveillance flights out of Butterworth, over the eastern Indian Ocean and South China Sea. Malaysia depends on it for its surveillance picture of the South China Sea. Yet, in spite of the closeness of these long-standing arrangements, Malaysia’s commitment to the FPDA has recently come under scrutiny, following its unprecedented cancellation of a scheduled air exercise in late 2015 for reasons that remain unclear. Cementing the bilateral Australia–Singapore military partnership provides a subtle way for Canberra and Singapore to mutually de-risk their dependence on Malaysia within the FPDA. Moreover, as the capability gap widens between Malaysia and the rapidly modernising armed forces of Australia and Singapore, it will be less able to keep up with their higher-end military interactions. Given the constraints on UK expeditionary capabilities and the modest defence assets that New Zealand can bring to bear, it may be that Australia and Singapore emerge in future as a core pairing at the centre of a looser five-power arrangement. The SAF already have a large footprint in Australia. This includes all basic flight training at RAAF Base Pearce, Western Australia, giving Singapore’s fledgling military pilots access to “two to three times” more airspace than is available at the RSAF’s South China Sea designated training area. Queensland’s Shoalwater Bay Training Area, three times the size of Singapore itself, provides the SAF with its primary venue for combined-arms exercises, with prepositioned equipment and armoured fighting vehicles located there. But it is already at full capacity. The SAF also conducts helicopter training at Oakey, Queensland, where 12 AS332 Super Pumas are stationed, and at Tamworth, New South Wales. Consistent with Project 2025’s objective of “increased access to, and enhancement of training areas” for the SAF in Australia, the 2016 Defence White Paper commits to “new training initiatives” with Singapore. Under the new CSP defence arrangements announced in May 2016, the SAF will have increased access to upgraded facilities in Queensland, centred on Shoalwater Bay and the Townsville field training area. This entails an approximate doubling of Singapore’s access, over a 25-year time frame, including up to 14 000 SAF personnel training in Australia for up to 18 weeks per year, up from 6000 personnel and six weeks’ training previously. It has been reported that air force training will also be expanded. Precise details of this have yet to be fixed, but it is understood that RSAF pilots will be able to train in Australia for up to six months per year. According to Singapore Defence Minister Ng Eng Hen, Australia’s value as a location for Singapore’s armed forces is about acquiring “more time and space to train”. But it is also about depth. Singapore seeks space overseas to avoid over-concentration of defence resources at home, where the SAF’s existing defence facilities face consolidation under pressures to optimise land use for a growing population. Singapore has extensive access to overseas training areas in 12 countries, including Brunei, France, Germany, India, New Zealand, Taiwan, Thailand, and the United States. But Australia’s geographical size allows the SAF to do more complex exercises and training than anywhere else. Singapore’s ability to maintain training access to Taiwan is probably the most tenuous of its existing overseas arrangements. The impending increase in the SAF’s presence in Australia is on such a scale that it suggests a consolidation of some of Singapore’s other overseas defence training arrangements. The CSP Joint Declaration includes a rather guarded reference to “respecting Australia’s sovereignty and noting Australia’s ownership” over training facilities earmarked for SAF use. However, existing FPDA and bilateral mechanisms provide a sufficient legal framework to cover the movement of military personnel within each other’s territory. While the CSP will deepen the bilateral relationship, there remain some questions for the defence relationship if it is to fulfil its potential, especially on the issue of how the two armed forces interact. First, to what extent will the SAF’s increased training access under the CSP actually promote cooperation with the ADF? Exercise Wallaby remains an all-Singaporean affair. Singapore’s tendency to “exercise with itself” is privately bemoaned by some within Canberra’s defence establishment. It is therefore important for Singapore to embrace bilateral defence engagement with Australia while Canberra is actively looking to thicken its military partnerships in Southeast Asia. In addition to the RSAF’s participation in the multinational Pitch Black air combat exercise, Singapore’s armed forces could be invited to take part in more Australia–US exercises, including Exercise Talisman Sabre which focuses on the planning and conduct of mid-intensity ‘high-end’ warfighting. The presence of Singaporean attack helicopter and strike aircraft pilots observing at Exercise Black Dagger in northern Queensland in April 2016 may portend such a trend. Another possibility would be to expand Exercise Trident to promote a higher level of amphibious interoperability between the two armies. RAAF fighter detachments could be invited to Singapore to train with RSAF units, resurrecting Exercise Churinga which included air combat practice between the RAAF, RSAF, and the Royal Malaysian Air Force and which has not been held since 2001. Second, what is the potential for Singapore’s and Australia’s armed forces to cooperate in out-of-area coalition operations? A small-scale precedent for this has already been set in Afghanistan, and during the 1999 United Nations stabilisation mission in East Timor. The ADF’s combat commitment in Afghanistan ended with the termination of Operation Slipper at the end of 2014. However, according to a 2011 Australian Department of Defence fact sheet, Singapore’s specialist Unmanned Aerial Vehicle detachment was providing “an overland surveillance capability to Australian Forces in Uruzgan”. An SAF medical contingent also worked alongside Australian forces. In his Singapore Lecture preceding the launch of the CSP, Tony Abbott hinted at bilateral defence cooperation “in the skies over Iraq”. Since December 2014, Singapore has been a military contributor to Inherent Resolve, the US-led coalition operation against Islamic State in Iraq and Syria, deploying a KC-135R aerial tanker, imagery analysts, and planners. Singapore’s tankers are capable of refuelling the RAAF’s F/A-18s, and have trained previously with Australian C-17 aircrews. Such a step would be a logical, incremental progression for defence cooperation within the CSP. Interoperability between the two air forces is likely to increase as they acquire more common platforms in future. This will almost certainly include the F-35 Joint Strike Fighter (JSF), which the RAAF has already committed to buy, and possibly the P-8 Poseidon already operated by Australia. Both air forces have ordered the Airbus A330 multi-role transport tanker. The JSF is the most significant of these, not only for interoperability between the RSAF and RAAF, but potentially enabling a deeper level of defence industrial collaboration between Australia and Singapore. Australia, as a partner in the controversial JSF program, has committed to purchasing 72 F-35A fighter aircraft. As part of this arrangement it will have a share in the maintenance and upgrade of the JSF throughout its lifetime. If Singapore decided to commit to the JSF it would probably opt for the short take-off and landing ‘B’ version. Even if the two air forces end up operating different JSF variants, Singapore will have good reason to seek out partnership with Australia, as a means of achieving economies of scale. This links to the intention within the CSP to enhance the existing Singapore–Australia MoU for Cooperation in Defence Science and Technology, renewed in July 2015. The potential for closer cooperation between Australia’s Defence Science and Technology Organisation and its Singaporean counterpart, the Defence Science and Technology Agency, has natural limits given the relatively small size of both countries’ defence industries. However, under Tony Abbott’s prime ministership, Singapore was rumoured to have been invited to tender for the Australian Army’s new Land-400 armoured vehicle. At the time of writing, no decision had been made by Australia’s Department of Defence. Finally, will Singapore–Australia defence cooperation include a multilateral dimension? Multilateral security coordination between Singapore and Australia goes back to the early 1990s and the establishment of the ASEAN Regional Forum. According to the 2016 Defence White Paper, Australia “strongly supports the contribution of the ASEAN-led regional security architecture to the security and stability of Southeast Asia”. The renewed Australian interest in Southeast Asia also reflects “the importance we place on the value of being active in regional institutions led by ASEAN”, including active participation in the ASEAN Defence Ministers Meeting (ADMM) Plus grouping, composed of the ten ASEAN members and Australia, China, Japan, South Korea, Russia, New Zealand, India, and the United States. Since 2014, Singapore and Australia have co-chaired the ADMM Plus expert working group on counterterrorism. Canberra views its current co-chairmanship as an “opportunity to continue building regional capacity, foster interoperability, build links and relationships and enhance information sharing”. This includes a large-scale maritime security and counterterrorism exercise, held jointly in Singapore and Brunei from 2 to 12 May 2016. Defence cooperation with Singapore therefore provides Canberra with opportunities to amplify its security roles and influence beyond the bilateral track. For its many advantages, and the absence of any serious differences between Canberra and Singapore, a number of risks overhang the relationship. One risk in the realm of intelligence cooperation is Singapore’s reputation for gathering intelligence universally. There have been past instances of “apparent Singaporean efforts to collect intelligence on Australia’s military capabilities”. This is well understood. Closer bilateral defence cooperation, including collaboration on sensitive defence technologies, is still likely to require careful handling. Singapore’s close links and cultural insights on China arguably lend it special weight as a source of expertise and strategic analysis. Yet China is also seen in some quarters as a “stark example” of Australia and Singapore “staring at the same thing” yet reaching different understandings, because Singapore “brings a Confucian cast of mind that Australia hardly grasps”. Differences in perception between Australia and Singapore are sharper on Indonesia. Singapore takes the view that Canberra errs towards naivety. However, such differences of interpretation hold the value to intellectual exchanges, official or otherwise. Singapore’s wider intellectual value to Australia is seen as a “country that set out to give itself centres of expertise in strategic thinking”, through a greater concentration of universities and think tanks than exists in most of Southeast Asia. A common criticism levelled at Singapore concerns its alleged transactional approach to relation building. Australia shares many interests in common, including respect for the rule of law, the English language, and a similar external outlook. In the public debate, Australia and Singapore are seen to share a “strategic cast of mind emphatically expressed in the approach to the United States” to the extent that it is impossible to “separate their affection” for the Seventh Fleet of the US Navy. Privately, however, senior policymakers in Canberra judge Singapore’s approach as being closer to “balancing for balancing’s sake” and in that sense it is contingent compared with Canberra’s values-based preference for allying with the United States. Doubts are sometimes privately expressed, on the US side, about Singapore’s reliability as a ‘phase-zero’ security partner, especially in a US–China conflict scenario. As a 74 per cent ethnic-Chinese majority state with Muslim neighbours, Singapore has no desire to be perceived as a proxy for Beijing. But with its growing reliance on inward migration from China, it would patently strain Singapore’s social and political fabric, potentially to breaking point, if asked to support the United States and its allies in a war against China. That important constraint on strategic cooperation needs also to be borne in mind by Australian strategic policymakers. One overrated risk is that Australia could find itself “squeezed out” of regional defence engagement because Southeast Asia is currently running higher as a US strategic priority than at any time since the Vietnam War. If this risk applies at all it does so strictly in the short term. The more relevant threat to Australia’s long-term interests is if the United States in future reduces its current level of commitment in Asia, because of economic stresses or domestic political imperatives. If the US regional presence retracts, it follows that Australia’s relative weight will count for more in Southeast Asia than it does currently. Singapore’s active interest in deepening the defence relationship with Australia could, in that case, be a harbinger of things to come. For Singapore, while Australia’s value as a strategic partner is premised on political stability, it would be remiss not to recognise the risk posed by leadership ‘spills’ and the ‘churn’ that has characterised Australian politics in recent years. With Tony Abbott’s removal as prime minister, Singapore suddenly lost its most vocal supporter in Australia. At the same time, Tony Abbott entered into office promising “more Jakarta, less Geneva”, but departed less than two years later, committed to upgrading Australia’s relations with Singapore as his signature Southeast Asian achievement. Malcolm Turnbull has already honoured his predecessor’s commitment to conclude the CSP ahead of schedule, notwithstanding a “personal” commitment to improving the bilateral relationship with Indonesia. That suggests, in fact, that a shared pragmatism between Singapore and Australia is more likely to prevail. The Singapore–Australia CSP needs to be seen in the context of Southeast Asia’s rising strategic profile. The 2016 Australian Defence White Paper suggests that Canberra is persuaded of the strategic need to pay more attention to Southeast Asia and to be more active in shaping its near region. Singapore is a natural partner for Australia because of commonalities in outlook and capability that are also unmatched elsewhere in the region. Beyond its national security and defence resources, Singapore also has the enabling capacity to serve as a hub for Australia’s growing security interests in Southeast Asia, including counterterrorism, just as it does in the economic sphere. While Singapore in some senses represents Asia in microcosm, Australians need to be alert to the trap of perceiving it as a proxy for the region. The CSP is not an alternative to bilateral engagement with Indonesia, or other key ASEAN members. Nor would it be wise to cast Singapore in that light. But it can be an important source of strategic ballast and continuity for Australia. To develop further, the defence relationship needs to evolve from a training ‘real-estate’ model to a reciprocal interoperability model. From Canberra’s perspective, the strategic value of the defence relationship lies also in maximising Singapore’s locational advantages, as a forward operating base in Southeast Asia, around which Canberra’s defence engagement can be leveraged, bilaterally and through the FPDA. The city state can add strategic depth for Australia, just as the reverse is true. For Australia, the challenge in realising the strategic potential of the CSP lies in persuading Singapore that it has as much to offer as a security partner as vice versa. In essence, that encapsulates Australia’s broader challenge in Southeast Asia. Tony Abbott, “Address to the 35th Singapore Lecture, Singapore”, transcript, 29 June 2015, https://pmtranscripts.dpmc.gov.au/release/transcript-24585. Energy Information Agency, “World Oil Transit Chokepoints”, Table 1, http://www.eia.gov/beta/international/regions-topics.cfm?RegionTopicID=WOTC. Russ Swinnerton, “A Description of Regional Shipping Routes: Navigational and Operational Considerations”, Maritime Studies 87 (March–April 1996), 10–22. Department of Defence, 2016 Defence White Paper (Commonwealth of Australia, 2016), 58, http://www.defence.gov.au/WhitePaper/. Malcolm Cook, “Southeast Asia’s Developing Divide”, The Asan Forum, 11 August 2014, www.theasanforum.org/southeast-asias-developing-divide/. Tony Abbott, “Address to the 35th Singapore Lecture, Singapore”. Ian Storey, Ralf Emmers and Daljit Singh, eds, The Five Power Defence Arrangements at Forty (Singapore: Institute of Southeast Asian Studies, 2011). Confidential interview with the author, October 2015. Lee Kuan Yew, The Singapore Story: Memoirs of Lee Kuan Yew (Singapore: Prentice-Hall, 1998). Singapore’s fixed-wing inventory includes five fighter/ground attack squadrons, mainly equipped with F-16C/D and F-15SG. Its air force also operates one squadron for airborne early warning and control, one squadron for maritime patrol and two squadrons in the tanker and combined tanker/transport roles. International Institute of Strategic Studies, The Military Balance 2016 (London: Routledge, 2016), 286–288. Euan Graham and Tim Huxley, “The US–Singapore Enhanced Defence Agreement: A Third Upgrade for Bilateral Collaboration”, The Interpreter, 10 December 2015, http://www.lowyinterpreter.org/post/2015/12/10/The-US-Singapore-enhanced-defence-agreeement-A-third-upgrade-for-bilateral-collaboration.aspx. Euan Graham, “Southeast Asia in the US Rebalance: Perceptions from a Divided Region”, Contemporary Southeast Asia 35, No 3 (2013), 305–332. Euan Graham, “Southeast Asian Perspectives of Regional Engagement and Power Projection”, in Naval Diplomacy and Maritime Power Projection, Proceedings of the Royal Australian Navy Seapower Conference 2013, Andrew Forbes, ed (Seapower Centre: Canberra, 2014), 80, www.navy.gov.au/spc/sites/default/files/publication-documents/SP13.pdf. Graeme Dobell, “Singapore and Oz: Mismatched Mates”, The Strategist, 24 August 2015, http://www.aspistrategist.org.au/singapore-and-oz-mismatched-mates/. Tim Huxley, “Southeast Asia’s Muted Reaction to the 2016 Defence White Paper”, The Strategist, 16 March 2016, www.aspistrategist.org.au/southeast-asias-muted-reaction-to-the-2016-defence-white-paper/. Gafoor, “Abbott’s Singapore Trip to Strengthen Old Ties”. Minister for Foreign Affairs The Hon Julie Bishop MP, “Joint Communique of the Ninth Singapore-Australia Ministerial Committee (SAJMC)”, 18 March 2016, foreignminister.gov.au/releases/Pages/2016/jb_mr_160318.aspx. Department of Defence, 2016 Defence White Paper, 69. John Blackburn, “Australia’s Liquid Fuel Security: A Report for NRMA Motoring and Services”, NRMA, 23 February 2013, www.mynrma.com.au/media/Fuel_Security_Report.pdf. Prime Minister of Australia, The Hon Malcolm Turnbull, “Australia–Singapore Comprehensive Strategic Partnership Announcement”. Tim Huxley, Defending the Lion City: The Armed Forces of Singapore (St Leonards: Allen & Unwin, 2000), 202. Mike Yeo, “Exercise Pitch Black Concludes in Darwin”, The Diplomat, 26 August 2014, http://thediplomat.com/2014/08/exercise-pitch-black-concludes-in-darwin/. Chow, “Defence Minister Hopes Australia Will Give SAF More Time and Space to Train”. Department of Foreign Affairs and Trade, “Joint Declaration by the Prime Ministers of Australia and Singapore on a Comprehensive Strategic Partnership”, 29 June 2015, http://dfat.gov.au/geo/singapore/Pages/joint-declaration-by-the-prime-ministers-of-australia-and-singapore-on-a-comprehensive-strategic-partnership.aspx. Department of Foreign Affairs and Trade, “Joint Declaration by the Prime Ministers of Australia and Singapore on a Comprehensive Strategic Partnership”. According to Singapore’s High Commissioner in Canberra, Singapore “was and still is a strong advocate of Australia’s participation in the EAS”: Gafoor, “Abbott’s Singapore Trip to Strengthen Old Ties”. Confidential interviews with the author in Singapore and Canberra, August and October 2015. Department of Defence, 2016 Defence White Paper, 11, 129. See Tim Huxley, “Australian Defence Engagement with Southeast Asia”, Centre of Gravity series paper #2, Strategic and Defence Studies Centre, Australian National University, Canberra, 2012, 4, http://ips.cap.anu.edu.au/sites/default/files/COG2_Huxley_Defence%20Engagement.pdf, and Daniel Baldino and Andrew Carr, “Defence Diplomacy and the Australian Defence Force: Smokescreen or Strategy?”, Australian Journal of International Affairs 70, Issue 2 (2016), 139–158. Department of Defence, 2016 Defence White Paper, 120. Euan Graham, “FPDA — Not Fade Away”, The Strategist, 21 October 2014, www.aspistrategist.org.au/fpda-not-fade-away/. Confidential interviews with the author, October 2015. Huxley, Defending the Lion City: The Armed Forces of Singapore, 203. Confidential interviews with the author, Singapore and Canberra, August and October 2015.
 International Institute of Strategic Studies, The Military Balance 2016, 288. Department of Foreign Affairs and Trade, “Australia–Singapore Comprehensive Strategic Partnership — Fact Sheet: Project 2025”. Department of Defence, 2016 Defence White Paper, 130. Black Dagger principally involves Australian and US Navy aircraft: http://alert5.com/2016/04/08/exercise-black-dagger-2016/. Department of Defence, “Australia’s Commitment in Afghanistan”, Fact Sheet No 3, http://www.defence.gov.au/defencenews/articles/1017/files/3_Australia’s%20commitment%20in%20Afghanistan%20Fact%20Sheet%203_May%202011.pdf. Huxley and Graham, “The US–Singapore Enhanced Defence Agreement: A Third Upgrade for Bilateral Collaboration”. Department of Defence, “Land Combat Vehicle System”, http://www.defence.gov.au/dmo/equippingdefence/land400, and confidential interview with the author, Canberra, October 2015. Department of Defence, 2016 Defence White Paper, 57. Tim Huxley, Defending the Lion City: The Armed Forces of Singapore, 206. Confidential interview with the author, Singapore, August and October 2015. Dobell, “Singapore and Oz: Mismatched Mates”. Bob Carr, Diary of a Foreign Minister (Sydney: New South Publishing, 2014), 342. Confidential interview with the author, March 2015. Anthony Bergin, “Darwin Defence Hub Crucial to White Paper’s Diplomatic Ambitions”, The Australian, 29 February 2016.